If you’ve been looking into ways to improve your smile, you’ve likely heard the term ‘veneer’. Veneers refer to a thin porcelain coating designed to go over your natural teeth to help remove imperfections and create a more beautiful smile. These porcelain veneers are bonded to your teeth in an effort to change their color, size, length, or shape, all of which is easily achieved. These dental veneers can be made from either porcelain, or from a composite resin, though the porcelain variety are much better at resisting stains than resin, and have a more natural appearance. If you’re trying to decide if porcelain veneers are the right choice for you, we have some information to aid in that decision. What Can Veneers Be A Solution For? 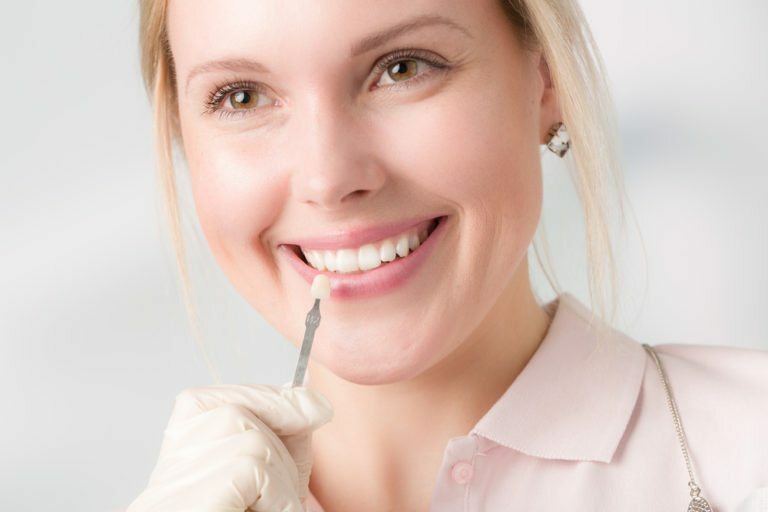 Discolored Teeth – Whether as the result of a root canal, medication, an overabundance of fluoride, smoking, or existing resin fillings that have become stained over time, veneers are perfect for solving issues with discoloration in the teeth. Worn, Broken, Or Chipped Teeth – Teeth that have taken damage can be corrected with veneers, giving you a smooth even smile again. Uneven, Irregularly Shaped, or Misaligned Teeth – Injury, decay, or natural growth can result in uneven surfaces on your teeth that take away from your smile. Veneers will solve these. Gaps In Your Teeth – Gaps between your teeth can be quite unsightly, but thankfully a veneer will cover these given you a nicely shaped set of closely set teeth. What Kind Of Complications Come With Veneers? Let’s start from the top, veneers simply lack the durability and strength of your natural teeth. As a result, you’ll have to take some precautions while living with veneers. It starts with being gentle with them, they’re certainly strong enough to handle normal day to day use, but you’re not going to want to be pulling any stunts with them. By this we mean no opening bottles with your teeth (which you shouldn’t do anyway) or cracking open nuts with them. Anything exceptionally hard you’re going to want to avoid, and this includes chewing on ice. What’s Involved In Getting Porcelain Veneers? The road to getting veneers is thankfully rather short, but there are a number of steps. First a proper diagnosis of your oral health needs to be obtains, and then planning set in motion for the next stages of the treatment. Preparation will involve the removal of ½ millimeter from your surface enamel to prepare for the placement of the veneer, you’ll need to discuss anesthesia options with your doctor at this time. A model will be made of your modified teeth, and this will be sent off to be made into your new veneer. At your next visit it will be bonded to your teeth with a permanent adhesive. Veneers provide a durable, long-lasting solution for those looking for a perfect, pearly white smile free from imperfections. They are more costly than other solutions, but their natural appearance, stain resistant nature, and overall beauty makes them worth it. If you think veneers are right for you, meet with your dentist to plan the best smile of your life!